Quiltville's Quips & Snips!! : Galaxy-Gram! 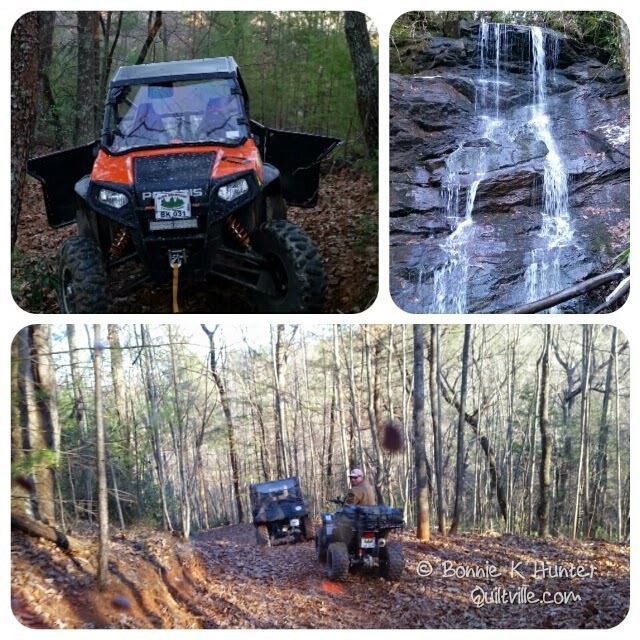 Time out for ATVs! This is a quickie post! After spending about 6 hours cutting down the scraps, I was enticed to go out trail riding with friends on our ATV's! We went on our way through the mountains, ending up at a gorgeous waterfall. We just got back, and are heading over to Mona's house for our birthday celebration dinner. I just wanted to shoot up this collage photo to give you a little glimpse into what went on here this afternoon. More full size photos to follow tomorrow, right now I've got a dinner to get to! Hope you have enjoyed your Saturday! NE Oregon here, Mr Quilter has been cutting up strips keeping happy as he does this. I've continued working on my white on white hand quilting project. That looks Like it was a Fun afternoon, Bonnie! I hope you and Mona had fun at your Birthday Dinner, also! GuiltGranma: I di not know what part of NE Oregon you are in- BUT That was one nasty pile up on I-84 between Pendleton and Baker. I Call it Baker, as that is what it was called when I graduated there. I still have relatives in the Ontario/Boise areas. I hope things are running smoothly there now.